So you’ve decided to grow your own from seed. Well done! No more restricted plant lists from the garden centre, they’re not called hardy annuals for nothing. To be fair, nurseries have to grow what sells and anything outside the box has a good chance of ending on the compost pile. When you grow from seed for the first time, you’ll be amazed by the number seeds that germinate and wonder how the plants can be used up. You can always give plants away, share with a friend or exchange plants. Garden stalls are popular fund raisers at fetes and fairs. Anyway, you’re faced with crowded trays of seedlings that need urgent attention. Later, you will have a better idea how many seeds to plant and how to deal with the excess. The seedlings have to be moved on to more spacious accommodation. There are different ideas as to the best size for pricking out. Some people prefer well grown seedlings because they are easier to handle, others prefer as small as possible to avoid root damage. I’ve lifted petunia seedlings showing two minute leaves with success. I think it depends on preparation and after-care. You need to try to see which suits you best. A good idea, if you choose the small seedling option is to use a plastic plant label to lift seedlings from the tray. Thoroughly wet your seedling mix first. It’s surprising how much water a good mix will absorb. A large bucket is fine for small amounts. You can use a trowel or your hands. If the mix is wetted well at first, watering later will be easier. Fill the tray or container to the brim with the mix and firm it with a float or a block of wood. A full container provides a large enough reservoir of moisture so that seedlings will not dry out. Use a dibber to make the holes for the seedlings. Space them about 30mm apart. The number in each tray depends on the tray size. Loosen the seedling mix with the dibber or plant label and lift the seedlings one by one. Choose seedlings about the same size for each tray so that they will be ready for planting out at the same stage. 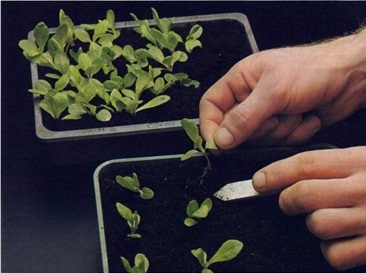 Always handle seedlings gently, by the leaves, to avoid damaging the stem. Seedlings will survive quite well if one of the leaves is damaged, but not if the stem is crushed.